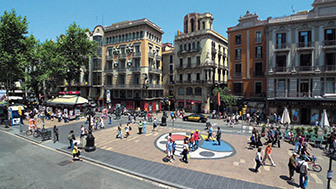 Plaça de Catalunya is the city's nerve centre, connecting the old town with the Eixample. Always bustling, it is the point where four important shopping avenues merge: Passeig de Gràcia, Rambla de Catalunya, Portal de l’Àngel and La Rambla. Plaça de Catalunya was built in 1889, following Barcelona's Universal Exhibition. 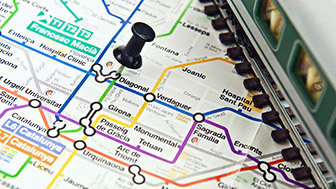 Its purpose then, as it is today, was to link the new Eixample district with the old centre. From the beginning it has always been one of Barcelona's breathing spaces, packed with cafés and restaurants that have seen literary and political debates, and which are still some of the main meeting points, even today. The square, which covers 48,500 square metres, became a city icon and holds public events, concerts and various civic gatherings. These days it is a major hub and is, in fact, regarded as Barcelona's nerve centre. It is surrounded by imposing buildings, and two big fountains add a touch of beauty to the upper side of this huge square, which is enriched with lots of urban art, sculptures such as The Goddess, by Josep Clarà; the Francesc Macià Monument by Josep Maria Subirachs; The Shepherds, by Pau Gargallo; and works by other artists, such as Josep Llimona and Enric Casanova. Below ground lies Avinguda de la Llum, a large underground avenue that was one of the city's first shopping centres and sparked the busy commercial activity in the square where, today, there are some big malls like El Triangle. The extent of the city's diversity is revealed in Plaça de Catalunya, a place where tourists, travellers, city dwellers and vendors, shops, and benches all meld together. Sitting on one of the benches or the terrace of the iconic Café Zurich and observing all this hustle and bustle makes you feel alive and part of Barcelona. There's not a person in the world who doesn't find life on the Rambla fascinating. 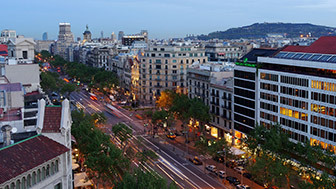 Passeig de Gràcia is Barcelona's most luxurious and refined avenue, a unique place in the world.